Food tastes so much better when it's cooked in the great outdoors, don't you think? Maybe it's just the West Coast girl in me, but I love camping and the food that goes with it. With the 3-day weekend coming up I'm gathering up gear for our annual camping trip on Washington's beautiful Hood Canal. A beachful of oysters will keep up satiated throughout the day but provisions for simple yet splendid meals are always a must. 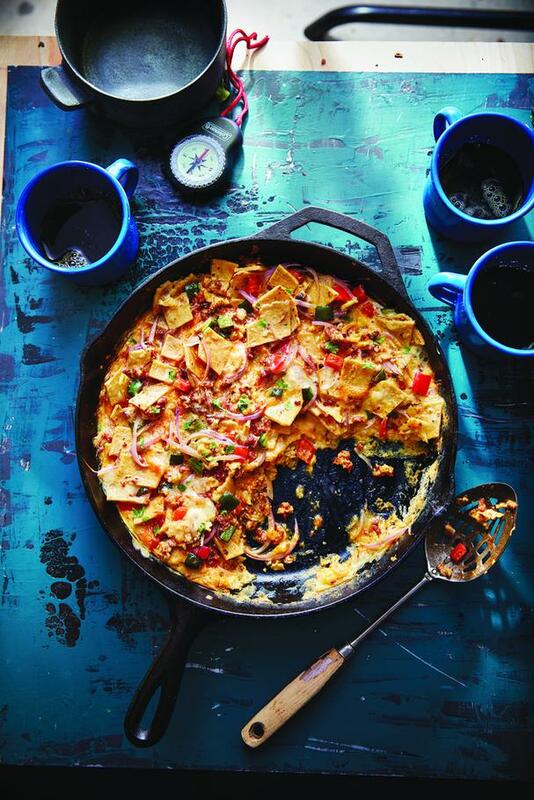 Who wouldn't want to wake up to a warm skillet of these delicious Southwest Chilaquiles? Spicy chorizo sausage, colorful red bell pepper and red onion, mild yet flavorful poblano chile, two types of Jack cheeses, corn tortillas, and eggs are cooked together into a casserole-like scramble that's topped with sour cream, fresh cilantro, and hot sauce. Who says you have to rough it when camping? This recipe is from our feature of The Outdoor Adventure Cookbook by Coleman. Get 3 more delicious campfire recipes here, like Canadian Bacon, Tomato, and Egg Campfire Stacks, Cinnamon Biscuit Bites with Brown Sugar-Caramel Sauce, and a S’Mores Cookie Cake. "Mexican chorizo easily crumbles, unlike its Spanish counterpart, which is dried, cured, and similar to salami." 1. Heat a camping stove to medium-high (about 375° to 400°F). Preheat a 10- x 3-inch cast-iron fryer with a lid on the camping stove for 5 minutes. Add the chorizo, and cook, stirring to crumble, until cooked through, 6 to 8 minutes. Using a slotted spoon, remove the chorizo to drain on a plate lined with paper towels. Add the bell pepper, poblano, onions, salt, and pepper to the fryer, and cook, stirring often, until the vegetables are softened and lightly browned, 4 to 6 minutes. Stir in the chopped tortillas. 2. Stir together the eggs, cheeses, and milk in a medium bowl. Return the chorizo to the fryer, and stir to combine with the tortilla mixture. Pour the egg mixture over the top, and cook until the eggs just start to set on the bottom and outside edges of the fryer. Gently draw the eggs from the outside edges to the center, repeating the process until the mixture is very loosely set. Reduce the camping stove heat to low (about 275° to 300°F). Cover the fryer, and cook until the eggs are set and the mixture is cooked through, 8 to 10 minutes. Sprinkle with the cilantro, and serve with the hot sauce and sour cream on the side.